PowerBook, iBook, iPod, and other portable computing is covered in The 'Book Review. General Apple and Mac desktop news is covered in The Mac News Review. News about Apple's transition to Intel CPUs and other Intel developments is covered in The Macintel Report. "Move out of the way, kids, because some of the hottest toys for this holiday season may have Mom and Dad eyeing your present underneath the tree. "This year for the first time, iPods and other digital music players made an appearance on the National Retail Federation's annual list of the top 10 categories of toys, which was released Wednesday. Though Barbie once again was the winner, iPods debuted in sixth place for girls - right behind video games. For boys, video games came first, followed by 'Star Wars' merchandise and Legos. "The inclusion of iPods in the survey is another sign that the line between children's toys and grown-up gifts is becoming increasingly blurred...."
"Not content with dominating our continent, now Apple is taking over Japan. For the first time, the iPod has moved ahead of Sony players to become the number one seller in Japan. iPods were lagging behind Japanese-made Sony players until July. In that month, the iTunes Japan store was launched. In just four days they sold more than a million downloads...."
CUPERTINO, California - November 21, 2005 - Apple today announced that it has reached long-term supply agreements with Hynix, Intel, Micron, Samsung Electronics, and Toshiba to secure the supply of NAND flash memory through 2010. As part of these agreements, Apple intends to prepay a total of $1.25 billion for flash memory components during the next three months. "We want to be able to produce as many of our wildly popular iPods as the market demands," said Steve Jobs, Apple's CEO. iPod and iTunes are leading the digital music revolution, providing the best way to listen to music on-the-go, at home and in the car. With over 30 million iPods sold, the iPod is the world's most popular digital music player and the iTunes Music Store is the number one online music store with over 600 million songs purchased and downloaded worldwide. The iPod economy also continues to flourish, with over 1,000 third-party iPod accessories now available. "Parents and police are concerned about new video technology that allows for the easy downloading of adult-only material onto portable devices. "The new video iPod from Apple, as well as many models of cellphones, allow for the downloading of video to the devices, such as legitimate programming such as music videos. "But users can also download graphic adult movie clips to the devices, meaning children could potentially watch whatever they want, whenever they want - away from adult supervision. "Det. Ian Lamond of the Toronto Police Services Child Exploitation Unit told CTV News he believes some schools may eventually ban photo cellphones and iPods from school property." PR: Belkin Corporation has been honored with the CES Innovations 2006 Design and Engineering "Best of Innovations" Award in the Audio Accessories category for its TuneStage for iPod. Along with this prestigious Award, Belkin also celebrates Honoree distinctions for six other products: PureAV RazorVision, TuneSync for iPod, Flip for Mac mini, TuneFM for iPod, TuneTalk for iPod, and TuneCommand for iPod. "The iPod accessory space has become a dynamic ecosystem with new product solutions launching every other week. Due to this competitive environment, we were really delighted that five of our seven CES awards went to accessory solutions for the iPod," says Ernesto Quinteros, Director of Industrial Design at Belkin. "Our TuneStage best demonstrated our commitment to a quality and seamless integration into the iPod experience," continues Mr. Quinteros. "We are very pleased that the CEA and IDSA have honored it with a 'Best of Innovations' Award." Winning entries will be showcased in a special display in the Las Vegas Convention Center Grand Lobby during the 2006 International CES, the world's largest annual trade show for consumer technology, January 5-8, 2006. All products will also be on display at the Belkin booths: 31247 South Hall and 8759 Central Hall. Sponsored by the Consumer Electronics Association (CEA) and endorsed by the Industrial Designers Society of America (IDSA), the Innovations Design and Engineering Awards highlight product advancements in technology design and engineering. All entries were judged by a preeminent panel of independent industrial designers, independent engineers, and members of the trade press. Now in its tenth year, the Best of Innovations Awards are given to the most highly honored products in all facets of the consumer technology industry. Learn how to import contacts and calendar events to iPod manually. "If you don't want to sync automatically using iTunes, you can transfer information to iPod manually. Note: iPod must be enabled as a hard disk if you don't normally connect with Disk Mode active." "If the road to hell is paved with good intentions, maybe the road to heaven is sometimes paved with mixed intentions. "Scott Wilson invented the iBelieve - an attachment that turns an iPod Shuffle into a cross that can be worn around your neck - as a comment on how we worship consumer products. 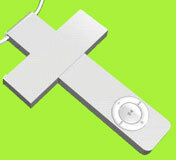 The iBelieve, he felt, was 'a social commentary on the fastest growing religion on the planet' - meaning iPod-mania. "Rather than take offense, Christians have embraced the gizmo." Inspired by the world's obsession and devotion to the iPod, iBelieve is a replacement lanyard for your iPod shuffle. It is a social commentary on the fastest-growing religion in the world. The iBelieve is constructed using the same materials and precision ball bearings as your existing shuffle cap so you can relax knowing your precious soundtrack is safe. Just toss your old cap habit, pop on the iBelieve and rejoice! Ten percent of every sale will go to various relief funds and children's charities. PR: Xitel has introduced HiFi-Link for iPod - a unique docking station that connects iPods to home stereos or televisions while charging them so they're ready for the next road trip. 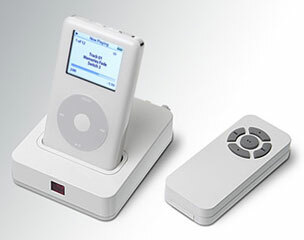 A "made-for iPod" accessory, HiFi-Link for iPod is one of the first products on the market to support Apple's hot new iPod with video and to take advantage of Apple's new Universal Dock design, ensuring compatibility with current and future iPods. "Now you can enjoy all of your iPod content on your home entertainment system - played through more powerful stereo speakers or viewed from a large-screen living room TV," said Barrie Davis, Xitel's president. "HiFi-Link allows iPods to seamlessly integrate with anything from a top-of-the-line surround sound system through to a simple boombox or regular TV." Built from the ground up for exceptional sound quality, HiFi-Link for iPod replicates the high-end outputs found on audiophile-grade equipment. By processing the cleanest possible signal from iPod's base connector, HiFi-Link for iPod provides exceptionally pure and dynamic audio for a true high-fidelity experience. Attention to detail is apparent in the quality of gold-plated line-level RCA outputs with matching studio-grade audio cable. Through the inclusion of SRS TruBass, Xitel's HiFi-Link for iPod also significantly enhances the lower frequencies of all music. Using advanced psychoacoustics, HiFi-Link for iPod adds back the warmth and depth that audio compression takes away. "While sensational sound quality and TruBass enhancement make HiFi-Link for iPod an outstanding audio product, our video capabilities really finish things off perfectly," Barrie Davis continued. HiFi-Link for iPod uses composite video output to enable photo and video viewing through any TV, while advanced buffering ensures sharp, crisp pictures without interference. Implementation of the Apple Universal Dock design makes HiFi-Link for iPod totally compatible with Dock Adapter clips included by Apple with the new iPod nano and iPod with video. A simple click and replace mechanism allows customers to also use clips included by Xitel for iPod color, iPod mini, iPod with dock connector and iPod photo. Combined with a full-size remote control and intelligent recharging, Xitel's HiFi-Link for iPod is a simple and convenient way to integrate iPod into your home entertainment setup. "Thirty years of developing advanced consumer electronics technology has allowed us to incorporate innovative features that set the HiFi-Link for iPod apart," said Davis. Play: Use your HiFi-Link for iPod with a home stereo, boombox, or plug in a set of powered speakers to create a dedicated iPod music center. View: Buffered composite output allows you to view sharp photos and video on your regular TV while maintaining pristine audio quality. Improve: Gold-plated, line-level outputs provide superior sound quality. Unique design means your stereo receives an exceptionally pure and dynamic signal for crystal-clear performance. Adjustable SRS TruBass creates rich, deep bass, adding back the warmth and depth audio compression takes away. Control: Powerful remote conveniently controls your iPod an extended distance - up to 50 feet. Swap between tracks, playlists, pause, play, fast forward, fast rewind or turn your iPod off. Charge: Power and automatically charge your iPod. Listen at home knowing your iPod will be ready to go when you are. Compatibility: HiFi-Link for iPod includes Apple's new iPod Universal Dock design for compatibility with present and future-generation iPods. HiFi-Link for iPod is made for iPod with video, iPod nano, iPod color, iPod mini, iPod with dock connector and iPod photo. The MSRP for the new HiFi-Link for iPod is $99.95. Xitel's new HiFi-Link for iPod is available in the USA starting mid-November 2005 through CompUSA, and Xitel's direct shopping service. PR: Earphone cable winders have been touched by the fashion age. The ever popular TUNECLIP has been given a hint of luxury. Announcing jewel Clip, a brand new cable winder with rhinestones that promise to tickle your heart. jewel Clip allows you to wind up your excess cable to the length you like. Never get tangled up again.Sparkling rhinestones and an oh-so-cute heart shaped design make this the stunning accessory to accent your style. Use it as a cable winder and not only is jewel clip pretty, it it also functional.Clip it to your collar or lapel and use jewel clip as a broach. 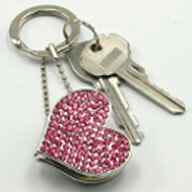 The clear rhinestones combined with the heart motif in very elegant way. jewel Clip is more that just a great fashion item. It is also very useful. There are two different sized stopper holes at the top and bottom of the clip to hold your cable so that it doesn't come unwound. Right away, you will wonder how you ever got by without your jewel Clip. The strong steel spring holds it fast to your jacket or jeans and with your cable wound up it is nice and compact. Use the included ball-bearing style chain to ad even more functionality. jewel Clip is available in two colors. Elegant white and casually glamorous pink crystal. Two colors to choose from so that you can match your own style. Or use both for the ultimate combination of elegance and beauty. PR: Now iPod owners can easily transfer their videos to the new video iPod Apple video iPod users, struggling to transfer their movies and videos to one of the hottest portable video devices on the market, now have a software tool to end their frustration. Video Vault for the Apple Video iPod, created by Diversified Multimedia, allows consumers to view their home videos, DVDs and tapes - wherever and whenever they want to - while traveling, hanging out with friends or while simply on the go. The popularity of the video iPod, only released on Oct. 12, is underscored by company sales figures indicating more than one million videos have been downloaded from its iTunes Music Store in under a month. But to date, there has been no simple way to transfer DVDs, VCDs, SVCDs, tapes or files to the video iPod. "The video iPod is an excellent device to view your videos on," said Todd Porter, Diversified Multimedia's founder and president. "But getting your content to the device is either not supported at all - in the case of DVDs, VCDs, SVCDs, and tapes - or highly dependent upon the codecs on your PC. Video Vault solves this problem in a simple-to-use interface that also helps consumers to organize their personal video library." Even Microsoft's own experts are thrilled about Video Vault. "As a Microsoft Media Center and Networking MVP and Expert Zone Columnist, I was recently asked if I knew anything about how to get non-copy protected media onto a video iPod," said tech writer Barb Bowman. "I knew about some geeky command line and spartan Graphic User Interface tools that would do the job, but the learning curve was steep and the amount of time needed to do a two-step transformation was long. Then I stumbled upon Video Vault for the Video iPod. This program is a fast and intuitive point and click interface that works blazingly fast and even transfers the converted content directly to an iPod." Video Vault users simply connect their video iPod to their PC, and Video Vault will do the rest. It even allows them to delete movies from their video iPod from within the Video Vault interface. "Our whole product line is devoted to helping consumers make the most out of today's portable and mobile lifestyle," said Mr. Porter. Last month, Diversified Multimedia introduced Video Vault for the Sony PSP, a similar application specifically designed for Sony's best-selling portable entertainment device. Diversified Multimedia's latest Video Vault software is one of the only accessories currently on the market specially designed for the iPod's video capability. It is perfectly positioned to be one of the most sought after iPod accessories this holiday season. Video Vault for the Apple Video iPod is available today online at a suggested retail price of $39.99 and will be available at thousands of retail locations later this year. PR: X-OOM Software, a leading publisher of multimedia software tools that help consumers get the most out of their digital media, today univeiled X-OOM MP3 Radio Recorder for iPod, a completely new way to discover new music and transfer it to the PC and iPod in just minutes. With X-OOM MP3 Radio Recorder for iPod, music fans can choose from 6,000 radio streams, spanning all genres, and record up to 20 channels simultaneously, with six-station recording most common for many broadband users. They can also add their favorite radio stations to the program's station list if a streaming URL is available. All recordings are saved as individual MP3 music files that can be automatically transferred to an iPod or another MP3 player. The software can also burn songs directly to CD or save them to existing music libraries stored on a hard drive. X-OOM MP3 Radio Recorder software is to the iPod what the digital video recorder is to television, minus the hardware and monthly service costs. The software allows users to schedule recordings of their favorite radio stations or specific programs, and play them back as MP3 files on their PC or iPod whenever they choose. Using X-OOM MP3 Radio Recorder for iPod, consumers can also sample tens or hundreds of songs in just minutes and simply delete those they do not want to keep. Also, through customizable filters, users can select only the artists and song titles they wish to record. With 6,000 stations to choose from, users are sure to find their favorite songs, artists and genres. The software also offers another important benefit; it allows music fan to instantly identify the artist behind that addictive song that's been stuck in their head all week. The software, through its song recognition features, displays song title and artist information, and a unique ID3 tag editor lets users add, edit, and delete ID tags at their convenience. Users can even store their X-OOM MP3 Radio-Recorder for iPod on a USB memory stick and use it on any computer with a connection to the Internet. With this functionality, prized MP3 files and favorite radio stations can be stored in a front pocket, and then conveniently played and shared with fellow audiophiles. ID3-Tag editor - An ID3-Tag editor allows users to add, edit and delete ID TAGs in MP3 files. Both single file and batch editing are supported, allowing users to burn all their MP3 files at once! The MSRP for X-OOM MP3 Radio Recorder for iPod is $29.99. It is available online and will be available at leading retailers in late November, just in time for the holidays. PR: Wondering how to make the most of the new iPod - the one that plays movies and music videos? Looking for an easy way to get your movies into an iTunes-compatible format? Not sure how to get the best results from QuickTime Pro? Say howdy to your new Podner. Reformatting your movie collection into iPod-ready files is a cinch with Podner. Just drag your movie files to the Podner window, tweak the settings (if you want) then let Podner get to work. Afterwards, your movies show up in a special playlist in iTunes. Then, just let iTunes synchronize with your iPod and you're good to go. It's all in a day's work for you and Podner. Still waiting for your new iPod, or just want to use iTunes to manage your movies? Podner can retune your movie files (even AVI and DivX, when installed) while preserving their original quality. PR: PodQuest is an application for Mac OS X that allows you to download driving directions to your iPod. Once you have downloaded your driving directions to your iPod, you can conveniently access the driving direction any time of the day, thanks to the backlighted display on your iPod. Fixed incompatibility with Google Maps. iPod setup for "Disk usage". PodQuest supports all model of iPods, except, for obvious reasons, the iPod Shuffle. PR: A small and simple utility for downloading RSS feeds to your iPod. Requires Mac OSX 10.4 Tiger or now OSX 10.3.9 Panther. Requires an iPod, iPod mini ,or iPod nano with Notes facility. For current iPod prices from a variety of sources, see our Best iPod Deals.